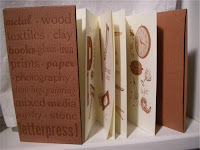 The Letter Press studio had an open house last night. They'd put together a plate to print a 12 page accordion fold book, and a separate plate for front and back covers. The plates themselves looked like works of art - take a closer look at the image to see what I mean. This is a self-inking press. The rollers keep spinning constantly while the press is on. To print a page we had to line up the paper, then crank the handle while helping guide the paper a little. Somehow, I expected to get ink everywhere. Guess that's because it's what I imagine happening if I tried such a thing at home. I asked Bonnie if the inks were oil or water based; turns out they're actually rubber-based. I didn't even know they made rubber based inks! And you have to clean them up with nasty stuff like xylene (I'm pretty sure that's the solvent she mentioned). Maybe letterpress printing isn't for me. But I love the results! One of the really cool things about letter press printing is the way that the the letters physically press into the page, sort of a reverse embossing. This is especially apparent on the covers of my little commerative book. This looks much better (and easier) than the pathetic accordion books I just made! I should have taken some lessons from you and Joe before beginning. When are you coming to visit next? 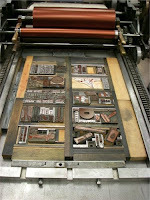 I know all sorts of accordion fold books, and Bonnie, the letterpress instructor, has promised to show me more.